More or less everyone nowadays runs the risk of becoming one of the socially discarded. The regular invocation of stock types along these lines — the “failson,” the cast-off workers who reportedly threw their support behind Trumpian authoritarianism — betrays an anxiety about a future that may not need most of us. Often this assumes the form of worries about displacement via automation. 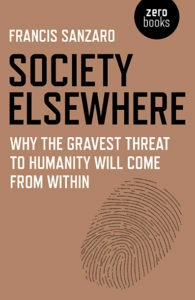 Francis Sanzaro’s Society Elsewhere: Why the Greatest Threat to Humanity Will Come From Within operates in this vein. It is an exercise in speculation about technologically-induced mass uselessness. Sanzaro forecasts that human cognition will become superfluous as AI and algorithms develop. Society Elsewhere is chiefly focused on the implications of this technology for work, culture, and nature; the book’s concern is less with its capacity to worsen inequality or environmental depredation than with a kind of spiritual lassitude. As technology is designed to take on more human activities, we will start to feel unnecessary. Sanzaro thinks that the future will consequently be marked by psychic malaise consisting of “decreased rationality, attention degradation, decreased awareness, drowsiness, complacency, reduced reactive time and loss of interest in surroundings”; this languor will become the foremost social problem. He amasses examples of the spread of this technology — in the book you can read about the use of “smart earth” technology to rationalize ecosystems, or automated caregivers in nursing homes — into a reckoning of its costs and blindnesses that is compelling and frequently persuasive. But his account of the coming useless world — how we were made to assent to our redundancy, what will happen to people under this condition — is less clear. Members of the professional classes have observed the generation of superfluous people with condescension. They imagine that their mastery of specialized bodies of knowledge and tireless cultivation of a personal brand has made their labor power singular and thus irreplaceable. If Society Elsewhere is any indication, they are wrong. Sanzaro emphasizes that it is not just blue-collar jobs that will be automated. One of the book’s most interesting chapters catalogs the ways this technology is being used. Sanzaro quotes several examples of texts generated by algorithms; they are convincing. There is an algorithm designed to generate political speeches, which produces lines like “Mr. Speaker, for years, honest but unfortunate consumers have had the ability to plead their case to come under bankruptcy.” Another uses a film script’s plot points as input to gauge its profitability; those involved with the movie can use it to adjust the script to boost its chances on the market. Besides work, algorithms are also being used to protect against the way we fail ourselves and each other. Sanzaro mentions a jacket that will administer hugs to children in the absence of their parents when its sensors indicate that they are upset, and a belt that dictates its user’s diet. The promises of this technology are well-known. It will give us what we really want, as evinced through data, not what we delude ourselves into thinking we want. The partiality of our cultural and political gatekeepers will be transcended by technology with allegiances to no one. Algorithms will create risk-free, market-based substitutes for treacherous or disappointing human transactions. Everyone will get what they want when they want it. Sanzaro is suspicious of this triumphalism. The best parts of Society Elsewhere take on the claims proponents of this technology make on its behalf. He thinks through their consequences with perceptivity. One of these is the prospect of workplace automation. Sanzaro posits that we are not headed toward a post-work utopia. Instead, labor will become even more stultifying, reduced to the management of automated processes. The sense of uselessness that this will entail will benefit tech companies, since the disengagement it involves will cause us to use their products more. He memorably points out the drab future imagined in an ad for Google’s self-driving cars, whose promise is only that automated driving will allow us to spend more time on our devices, clicking around to refine algorithms. The art that could be produced by this technology does not come across any better. The argument goes that if making art is just another labor process, then it too can be improved through automation. But Sanzaro notes that things like algorithmically produced songs or novels are “past-facing”: based on input from previously successful works in their medium. Art produced in this way repeats itself sealed off from its surroundings; because it neither reflects nor responds to them art will become another self-generating process that we watch in a state of bored detachment. The problem of algorithmic art is one instance of a broader destruction of context enabled by this technology that he astutely identifies, as in the way we diminish our knowledge of our surroundings by offloading the work of retaining information about them onto devices. Society Elsewhere does not just debunk the claims that have legitimized this technology. Sanzaro’s ambitions for the book are grand. At times he characterizes his project as outlining a “baseline intelligence” against which to measure shifts in consciousness brought on by algorithims and AI. He announces early on that “this book is about humanity, you and I, the things we love, our children and our happiness,” and it seems like he wants to get at nothing less than “humanity” itself. The book can come across as magniloquent. Sanzaro frequently poses irresolvably broad questions: what should work be, what is culture. These are answered with grandiose pronouncements. He repeatedly suggests that algorithms are manifestations of far-flung human propensities: at one point he compares an algorithm that can supposedly determine what images people will find beautiful to the golden ratio in that both combine math and art. Sometimes to make these connections he appeals to a mythical prehistory. Talking about whether AI will eventually overwhelm human agency, Sanzaro says that “peoples have been influenced from the outside for millennia, and the simple phenomenon of thunderstorms has had a profound impact on early rituals.” Because the scope of the book’s historical narrative is this wide, it often becomes gauzy. Concrete questions about what exigencies are driving the growth of this technology, what effect it has on our lives, and what potentialities can be divined from it all dissolve at this level of abstraction. Sanzaro also tends to universalize fast and loose. One of his arguments is that algorithms will destroy taste. Instead of appraising cultural products, we will sit passively as algorithms engross us in what they have already determined that we like. That much is possible. Yet he seems to think that taste is an autonomous expression of pure instinct. He says that “Taste is an outward-facing vote, an act of our will we place onto the world”; it is synonymous with “choice, preference, things we like, buy, sleep with, eventually love.” He thereby minimizes the way social factors influence our taste, which is often an expression of group belonging or social positioning. This is an odd omission for a book focused on how new technologies will reorient collective life. Sanzaro acknowledges this wider dimension of taste in some capacity when he says that “No culture to date has been agnostic about how it surrounds itself . . . Taste is a decision, nearly imperceptible, equal parts rationality, instinct and gut, by which we transmit the things of the past and present to the time yet to come; each instance of taste, therefore, is a vote of confidence.” But this argument confuses the distinction between taste and culture, and it is configured in general terms that reveal little about how taste works now, how technology undermines it, and what a world without it would be like. Sanzaro ultimately insists on “our value as participating members within ourselves” and our value within “the economic, emotional, and creative economies surrounding us.” He defends our ability to contribute to our environment. On this front, Society Elsewhere can be convincing. Sanzaro has hit on an important potential of this technology: its ability to consign people to uselessness, with all the dejection that involves. He sees through its official promises and extrapolates a future of widespread torpor that is credible. But he transplants the terms of his argument to a nebulously ahistorical plane in search of a timeless human essence. From this remove, the condition Sanzaro is trying to describe is lost. J.H. Holt lives in Central New York..